“Below Sea Level”, the project I’ve been working on for the past 8 months or so, opened last Saturday, April 4th at Mass MoCA! (The day before my birthday!) The artist is Pawel Wojtasik, and the soundtrack is by Stephen Vitiello. The photo shows Pawel in profile. I have written some short articles on capturing the panoramic footage and preparing the piece for projection. There is a nice extract of the piece on Vimeo – watch it! It’s an impressive piece, artistically and technically, and now that it is up and running, I feel like I can write a bit more about the piece, having worked on it so intensely and so closely. The first question that comes to mind when first encountering the piece is, why a cyclorama, and why does it fit the subject of the piece? One of the defining attributes of a cyclorama, of a panoramic theater, is that it does not guide the attention of the viewer. The viewer has to explore the cyclorama, looking in all directions, discovering for themselves meaningful images and events within the scene. To some extent, this is why this format worked for this subject: the piece is more about New Orleans as a living, breathing place, able to recover and survive from disaster, and not the city as tragic victim of a hurricane. From the very beginning, Pawel believed it was important that the piece not be strictly didactic, that it not “point the finger”, but rather immerse the viewer and let them discover New Orleans in all its richness, by actively exploring. While New Orleans has had a tragic relation with the waters around it (most recently, but not only, due to hurricane Katrina), this relation is much deeper and complex. The water around New Orleans is its economic and cultural lifeblood, but also its potential nemesis. At the same time, the industry around New Orleans in turns threatens the wetlands around it, increasing the risk of natural disaster. What brings hope to this picture is the natural resilience of its people, and their passionate drive to preserve their way of life. This is part of what the piece hopes to capture, how New Orleans exists due to its unique culture and people, and is not just an industrial or economic or geographical artifact. Another key challenge was ensuring that the work not be seen as a technical exercise, as an immersive “amusement park ride”. In early tests, we discovered that using exclusively panoramic footage, and projecting it in a circular theater without alteration, tended to read more as an amusement park ride, as something to be seen at Disney’s Epcot Center. This is not something we wanted! It was important to work with the panoramic footage, but in a more surprising and transcendent way. In order to do this, we made the most of techniques that are unique to panoramic footage, but not strictly “realistic”, such as using the full dome recorded by the panoramic camera, and by seamlessly stitching multiple panoramic images, sometimes displaced in time. This creates a sense of immersion on the one hand, but on the other hand introduces a subtle distortion that alerts the viewer to the fact that this is not “reality”, that perceptions are being manipulated. An important technique was to interleave the use of conventional video footage, often in 3, 4 or 5 channel montages. The panoramic camera imposes a fixed distance – it always sees all the way around, and it is impossible to frame a medium short or a close-up. By using additional camera footage, it was possible to change effective camera distance, bringing the viewer close in to important scenes. This is especially dramatic in close-ups of people’s faces! 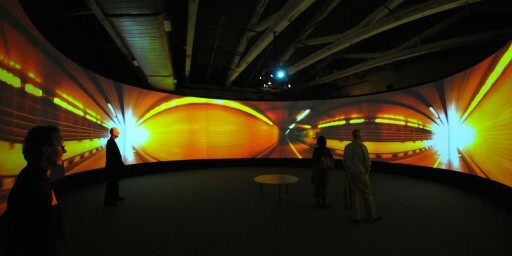 At the same time, using multiple simultaneous channels of video preserves the element of exploration and discovery so important to the cyclorama format. In addition, using multiple sources of video allowed interesting changes to the rhythm of the piece, going from sweeping motion (in the airboat sequences) to painterly, almost-still, images. 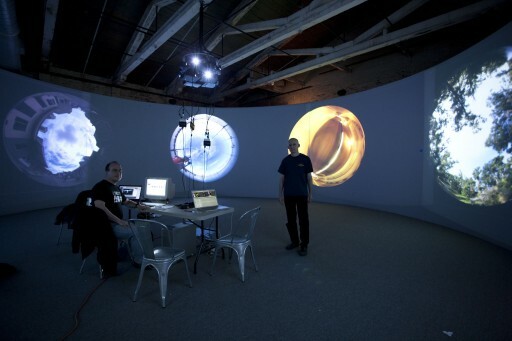 Stephen Vitiello’s score is key to the cohesion of the work. It sets the emotional tone of the work from the very beginning, where the imagery is primarily concerned with nature and the encroachment of industry, and maps out an emotional progression of increasing intensity, culminating with the spectacular march of the Mardi Gras Indians. Finally, he references a melancholy trumpet solo during the coda, bringing the viewer’s attention back to the ongoing (and problematic) ecological situation, and making it clear that full resolution has not been reached, that there is no clearcut answer. Finally, Denise Markonish has been instrumental in commissioning the work, and placing it in a meaningful context. As part of the group show “These Days: Elegies for Modern Times”, it was important that the work have an elegiac tone, in the Romantic sense of “a poem of solitude and mourning” and not be overtly documentary or didactic. The tragic heart of the history of New Orleans, from a time long before Katrina, seems a perfect subject for an elegy. In this sense, “Below Sea Level” is a crucial piece of the group show, elaborating on and complementing the central ideas that it represents. “Below Sea Level” is part of “These Days: Elegies for Modern Times” at Mass MoCA, on show until February 28, 2010.